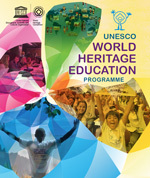 The UNESCO World Heritage Education Programme, initiated as a UNESCO special project in 1994, gives young people a chance to voice their concerns and to become involved in the protection of our common cultural and natural heritage. It seeks to encourage and enable tomorrow’s decision-makers to participate in heritage conservation and to respond to the continuing threats facing our World Heritage. Young people learn about World Heritage sites, about the history and traditions of their own and other cultures, about ecology and the importance of protecting biodiversity. They become aware of the threats facing the sites and learn how the international community as a whole unites to save our common heritage. Most importantly, they discover how they can contribute to heritage conservation and make themselves heard. The World Heritage in Young Hands Kit has been tested and adapted to national needs and presently exists in 43 national languages. To date, 13 animated short film episodes of “Patrimonito’s World Heritage Adventures” have been produced. About 40 international and regional Youth Forums have been held with an estimated 1560 young people participating. Nearly 1250 teachers and educators have been trained through about 40 seminars and workshops at national, sub-regional, regional and international level. Since the launch of the World Heritage Volunteers projects, more than 3500 volunteers have taken part in 359 youth camps in 61 countries. to become involved in heritage conservation on a local as well as on a global level. of the importance of the UNESCO World Heritage Convention (1972) and a better understanding of the interdependence of cultures amongst young people. to introduce/reinforce World Heritage education in the curricula in the vast majority of the UNESCO Member States. in the promotion of World Heritage Education on a national and international level. The Programme is led by the UNESCO World Heritage Centre (WHC) in coordination with the UNESCO Associated Schools (ASPnet) and in close co-operation with UNESCO Field Offices, National Commissions for UNESCO and other partner stakeholders. The World Heritage Centre is the focal point and co-ordinator within UNESCO for all matters related to World Heritage. It ensures the day-to-day management of the Convention, organizes the annual sessions of the World Heritage Committee, assists States Parties in the preparation of site nominations, organizes international assistance and reporting on the conditions of the sites, organizes technical seminars and workshops, develops educational activities and materials to raise awareness among young people of the need for heritage preservation and keeps the public informed of World Heritage issues. The UNESCO Associated Schools Project Network (ASPnet), created by UNESCO in 1953, is an international network of 9566 schools in 180 countries (as of September 2013). ASPnet conducts pilot projects that aim to better prepare young people and teachers to meet present and future challenges as well as promote education for a culture of peace and international understanding.Successful ASPnet flagship projects, such as the World Heritage Education Programme, are designed to have a multiplier effect whereby innovations are incorporated into mainstream of education and thereby enable all schools to benefit.